Homeowner » How much do solar panels cost to install? With the Government ending its Feed-in Tariff incentive for homeowners installing solar panels in April, now’s the time to install while it still pays. But how much do solar panels cost? What will you save? How much can you expect to receive in returns? Where to start? Solar panels come in two different types – Photovoltaic (PV) cells which convert sunlight into electricity and thermal panels, which provide heat for hot water and space heating. They have been installed in both forms by homeowners on their roofs since the latter part of the 20th century in the UK. Interest in and installations of PV panels really took off. After the introduction of the Feed-in Tariff (FiT) scheme in April 2010. The scheme aimed to solve the problem of over-supply at the wrong time and the inability to store generated electricity by paying homeowners over a period of 20 years, not just to generate the power but to feed the excess back into the grid. Every home where PV panels were installed therefore became a contributor to the UK’s energy system. At its most generous in 2011, the FiT scheme paid homeowners 52.75p/kWh for the electricity generated plus an additional 3.72p/kWh to export it back to the grid – meaning many homeowners were (and still are) enjoying incomes of over £2,000 from their domestic solar panels (installation costs were much higher back then). Due to various political reasons and also the fact that installation costs have reduced and battery solutions have improved, the Government has announced that the FiT scheme will close to new applicants from 1 April 2019. This does not impact on homeowners who have installed and are already receiving FiT payments – those will continue at the rate to which they were signed up. 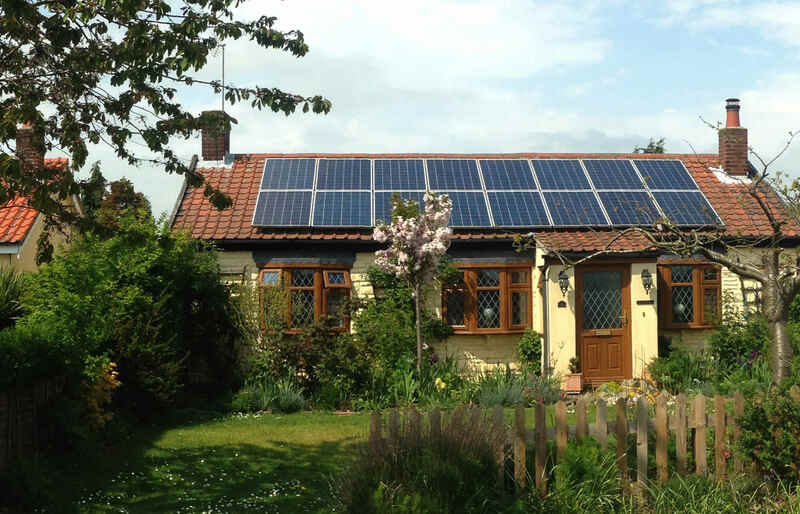 To date, there have been over 900,000 installations of solar panels on UK homes. The imminent closure of the Feed-in Tariff scheme is clearly sharpening the focus of consumers looking to install solar panels: during November 2018 alone, there have been 4,066 domestic installations confirmed — the highest number of installations in a month since September 2016. The rush to install before the deadline is clearly on. What will happen to government support for solar after April 2019? The Government is committed to closing the FiT scheme in April 2019, and despite pressure from environmental groups and other lobbyists, including the solar industry, there is no news yet on any replacement incentive scheme. How much energy do solar panels generate? The power rating of panels varies by their size and type (see below) but typical panels have a 0.25kWp rating, meaning that they can generate 0.25kW at peak levels. Most domestic installations tend to be either 3kWp (12 panels) or 4kWp (16 panels). For context, your kettle requires 3kW. Typically, installers expect panels to generate 80% of their peak capacity. So, at their best, if all the panels were generating well for 8 hours on a sunny summer’s day you would create a maximum of 19 or 25kWh (kWh = kilowatts x hours generated) per day. Installers also work on the basis of around 50% of the generated electricity being unused in the home and therefore exported to the grid depending on usage patterns. A 3kW system would therefore typically produce around 2,600 kWh during a year, of which half would be used in the home and half exported (as the panels produce energy when you need it least). A 4kW system might hope to produce around 3,400kWh over a year. According to OFGEM, the typical house uses between 3,200 and 4,100kWh a year. The typical cost of electricity in the UK is currently around 13.3p/kWh, giving a typical annual bill of £427 – £547 (plus standing charges). The Government’s Feed-in Tariff (FiT) scheme is closing to new applicants on 31 March 2019. Your application can still be processed after this date as long as you apply before it and if the application is granted you will receive FiT payments at the current rate. However, in order to limit the amount of funding the Government commits to, they established a so-called ‘Deployment Cap’ which limits the amount of funding they commit to in a particular period – so if there are lots of last-minute applications, it may still be refused. Under the current rates, which run from 1 January to 31 March 2019, homeowners with an EPC at a D rating or above installing a standard domestic system will receive 3.79p/kWh generated with an additional payment of 5.24p/kWh for energy exported to the grid. How much money can I make from solar panels? The amount that individual homeowners receive in return will vary on many factors, from the orientation of the roof and the size of the installation to your own energy consumption patterns. On average, however, a 4kWp system performing to the higher level of expectations (generating 3,400kWh) would provide around £129 of income per year (tax-free) for energy generated, with an additional £89 per year coming from the export tariff. This is based on the assumption that 1,698kWh (just under half) of the generated energy is exported to the grid and is based on the consumption pattern of a working family who consume most of their electricity at night. Can I still benefit from solar power once Feed-in Tariffs end? Once Feed-in Tariffs are withdrawn in April 2019, homeowners will be expected to export any unused energy back to the grid for free. Once the tariffs are removed, the only benefit of installing solar panels is in the replacement of bought-in energy with that generated on site. For a 4kW system this would be 50% of 3,400kWh = 1,700kWh. The cost of buying this electricity is around £226/year, giving a benefit over 20 years of £4,520 (not allowing for energy price inflation). Again, this all depends on your own usage patterns – people at home during the day (when the power is generated) are likely to be able to benefit more than the average. As a result, most experts believe that storage of that unused energy for later use is the only way to really make solar power pay after April 2019. A range of new lithium ion (Li-ion) batteries are now available that make the promise of battery storage a practical reality. The best known of these is the Tesla Powerwall 2, which holds up to 14kWh (around 1.5 days’ typical generation in summer) and can output 5kW continuously and 7kW spot energy. Batteries remain expensive – the Tesla system costs around £5,000 for the battery itself plus approximately an extra £1-2,000 for the installation and associated hardware and wiring. Over 20 years that equates to a cost of around £300/year, which makes it marginal in terms of cost-effectiveness (the Tesla comes with a 10-year warranty). There are plenty of other options, with Sonnen, Powervault and Solax well-known names. The way to compare prices is by looking at the cost per kWh of storage capacity – and also considering the output rates, bearing in mind it would need to be at least 3kW to power your kettle. Is installing solar panels still worth it? The current rates (available until March 31 2019) enable homeowners to get their money back and enjoy a very small dividend over the lifetime of a solar installation (20 years). The financial benefits of installing solar panels once the Feed-in Tariff ends are very marginal. Do solar panels need cleaning/maintenance? Solar panels work more efficiently when they are cleaner. The taller the pitch of the roof, the less likely the panels are to gather dust or bird droppings; the relatively large and regular rainfall in the UK tends to give them a regular rinsing. However, if your panels are regularly getting bird droppings on them then you will need to clean them. The good news is that many installers offer self-cleaning solar panels which consist of a hydrophobic coating on the glass, which stops raindrops from sticking to the surface. As they drop off, they clean the glass very effectively. From a maintenance perspective, it’s also important to ensure that nearby tree branches are not growing too close to the panels over the years – overhanging leafy branches will affect your panels’ output. Solar panels clearly benefit from direct sunlight but still generate using daylight – not heat, meaning they can generate (smaller amounts of energy) even on cloudy winter days. As daylight hits the cells on the panels it is converted into direct current (DC) energy. This passes through an inverter to turn it into the AC energy we use around the house. Excess unused energy is then fed back to the grid. PV solar panels consist of semi-conducting silicon-based cells covered in glass. There are, however, different types of PV panel with the variation being the silicon itself as well as the type of glass. The closer the alignment of the silicon molecules, the more efficient the panel. Monocrystalline solar panels are the most efficient and most expensive type of solar cell, converting more energy and getting more from lower light levels, with greater durability. As they’re more efficient, they tend to require less space on your roof. Polycrystalline solar panels consist of cells where many silicone crystals are bonded together. They tend to be cheaper to produce (and are cheaper for homeowners to buy) but they tend to be less efficient and less durable than monocrystalline cells. 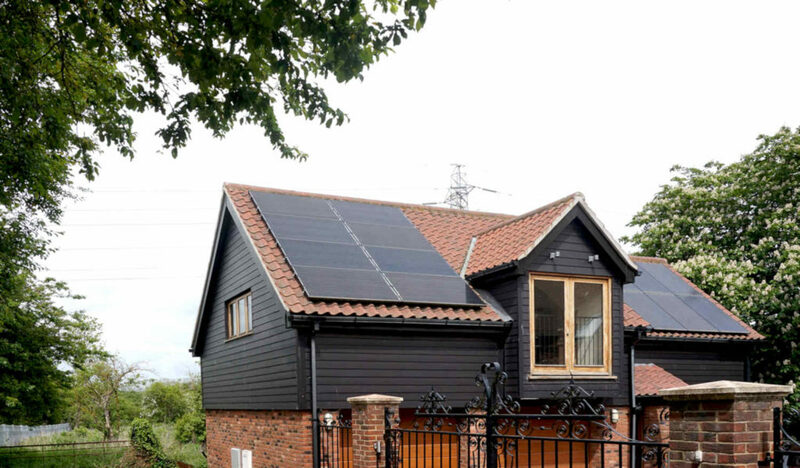 Solar Tiles are a smart option for those looking for a solution to blend in with an existing slate roof, solar tiles are the same size as the typical roof slate and can be interlocked into the existing tiles, making a seamless finish. They look great but tend to be less efficient and also more expensive both to buy and install than traditional solar panels. Types of Glass: Your installer may give you a choice between plate and strengthened glass. Plate glass is the standard (and cheaper) solution but a strengthened glass will be less likely to be damaged and can even improve the efficiency of the silicon cells it is designed to protect. Is my home and roof suitable for solar panels? Solar panels harvest solar energy in almost all circumstances – but maximising the benefit is all about looking at your own home’s situation. As a northern hemisphere country, the best orientation for solar panels in the UK is south-facing, so the panels can enjoy the sun as it moves through the eastern, southern and western sky during the day. Because the height of the sun in the sky changes based on the season and the panels work at maximum efficiency when angled directly at the sun, the ideal pitch of solar panels would need adjusting throughout the year – steeper in winter (as the sun is lower) and flatter in summer. Clearly that is impractical for most people so experts tend to agree that around 30˚ is the best compromise. Again, solar panels will generate some energy in almost all instances. Panels vary in size but the typical panel is 1m x 1.65m. Typical 3kWp arrays of panels (12 standard panels) will therefore need 20m2 of roof space. The amount of useable roof space obviously varies with different houses, but it’s possible that if you live in a small mid terraced home you might only have between 15-18m2 of potential space – so factor that into your planning. Will having solar panels increase my home’s value? Estate agents will not tend to give a property a higher value if it already has solar panels attached, although they do recognise the benefits it brings to buyers (the Feed-in Tariff payment stays with the house, not the owner). Will I need planning permission to install solar panels on my home? The installation of solar panels is part of your Permitted Development Rights – meaning you don’t need to gain formal planning consent to install them. There are, however, exceptions to this rule, such as limiting the installation of panels to the rear of a property in a Conservation Area, and prohibiting them entirely if your home is Listed. Your home might also be exempted from Permitted Development Rights under an Article 4 direction. If you have the land and intend to install stand-alone panels in your garden rather than on your home’s roof, the array can be no bigger than 9m2 and must be at least 5m from the boundary. – Don’t generate energy when it’s most needed – there’s a lot of wasted energy. How can I find a good solar panel installer? In order to qualify for the Feed-in Tariff scheme, an installer will need to be certified under the Microgeneration Certification Scheme (MCS – you can check on the MCS website). Look for an experienced installer who has performed installations on similar local properties, hasn’t caused damage to existing roof tiles and is willing to handle everything from scaffolding through to the FiT application on your behalf. To find an expert qualified solar panel installer start your search on Checkatrade.com. The typical price of a 4kWp solar panel installation (16 panels) in the UK at the moment is around £6,000 – £7,000. With the advent of the end of the Feed-in Tariff, some suppliers are offering time-limited discounts in early 2019 with prices as low as £4,500 – £5,000 for a 4kW system. Erect the scaffolding – This is essential for the safety of the installation team. It’s worth checking that the cost for installing the scaffolding is included and that there’s enough room outside your house for the scaffolding tower. Attach roof anchors – The roof anchors are there to hold the frame for the solar panels and the type of anchor used will be determined by the type of roof tile fitted. The installation team will start by lifting some of the tiles on your roof and fixing the roof anchors to the rafters. The installer should have already gone into the loft during the survey to check that the rafters and the roof are suitable for installing solar panels. Attach the frame – The aluminum frame (or solar panel rails) attach to the anchors, which run vertically and horizontally across the roof. Install the solar panels – The solar panels are not fitted onto the frame. The panels clamp loosely to the frame, then they’re tightened once the installer has positioned them in their optimal angle. Solar panel wiring – This is where you’ll need a certified solar installation team. The panels usually come prewired from the manufacturer but they still need to be connected to an inverter. Whilst the installation team are busy installing solar panels onto the roof, the electrician will set up the inverter in your house (usually in the loft). The inverter converts generated electricity – direct current (DC) – into usable alternating current (AC). After that, your free electricity is ready to be used by electrical appliances in the house. You’ll need to switch off the electricity at the fuse box before this step. Final checks – The electrician makes the final connections to the consumer unit and normally installs the generation meter near the fusebox. Once this is completed the electrician switches the electricity back on to test the solar installation and confirms that all the units are performing as expected. Receive MCS certification – You’ll receive your certification usually within two or three days, once the installer has registered the solar installation with MCS. When considering your options for solar panel installation it’s always worth taking advice from an expert. Our Checkatrade Expert Richard Harvey of Greenscape Energy Ltd offers some insights on what to consider before you find your solar panel installation company and start your project. With the Feed-in Tariff deadline fast approaching, every solar installer in the country will be working flat out to meet the demand for solar. You need to register your interest soon as possible to ensure you do not miss out. Especially for ground-mounted systems, which may require planning permission, or PV systems larger than 4kw (14 panels) which require an application to the national grid. These applications are likely to take 8 weeks, so customers considering these systems must act straight away. String inverters limit the output of the entire solar PV system to the performance of the worst performing panel. So a slight shadow from a chimney/tree/nearby lamp post will make a surprising amount of difference to your production over the year. This issue can be overcome with an installation where the solar panels are working individually, using either power optimisers or micro-inverters. One of our colleagues has a chimney on his roof. By using the online monitoring software, we can tell that he would have produced around a third less if he did not have micro-inverters. Batteries can still be hard to justify from a financial perspective when looking at the potential savings vs their upfront cost. Customers are currently better placed to spend their budget on increasing the size of their generation potential by installing additional panels and individual panel optimisation. We would expect the price of household batteries to fall to a more justifiable level in the next year or two and they can be added onto any solar PV system at a later date. Your Feed-In-Tariff payments are guaranteed for 20 years, and your savings on electricity continue an indefinite amount of time beyond that. Customers often discuss how they could reduce their current electricity bills with solar, without considering how their electricity consumption may shift in years to come. Aside from the uptake of batteries in the coming years – allowing customers to become less reliant on grid electricity, most would also expect the future to entail a shift from petrol and diesel towards electric vehicles, whose thirst for electricity would dwarf the current annual household electricity bill. Don't miss the March 2019 deadline!